CROSSWATER LANDSCAPE was founded by Steve Yaffe over 30 years ago. The Crosswater Company has evolved over the years and consists of a small team of dedicated, skilled individuals who have provided clients, some for over twenty years, with professional services of the finest quality. Our full-service landscaping company can plan, install, and maintain every aspect of your property. Our wide range of nursery connections, as well as our own greenhouses on site, allow us to guarantee choice selection and availability of plant material. We have been involved in over 500 substantial landscape projects ranging from Crosswater self-designed to working with some of America's finest landscape architects. We have great working relationships with many local architects, builders, and designers as well. Crosswater Landscape has worked with many homeowner's associations from their conception; we have created and meticulously maintained some of the most beautiful properties on the Vineyard. Our wide array of services include excavation and site preparation, design, site-planning, masonry, stone work, arborculture/tree care, clay tennis court construction, installation of irrigation and maintenance for all work contracted. We feel that the importance of turf and planting irrigation is often neglected, but it is of great importance to insuring a beautiful landscape for years to come. Another aspect of our work includes custom-built outdoor showers, arches, fences, decks, pergolas, lattice, arbors, and window/planter boxes to compliment the planting design of the property. Heavy equipment enables us to create ponds, Japanese rock gardens, and large stone placements. We have designed and implemented many stonewalls, walkways, terraces, and driveways, of lasting value and aesthetic beauty. 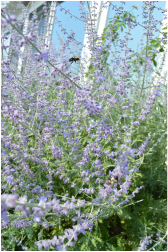 We specialize in wildflower meadows, spectacular spring bulb and perennial gardens, as well as, the creation of natural habitats using native plantings which encourage the proliferation of wildlife. We represent clients through the permit acquisition process with the various conservation commissions/boards and contacts with DEP. We have been involved in dune reclamation/revegetation, wetland replication and beach stabilization for approximately 20 years and are familiar with the conservation community and its ideology. Our site-sensitivity and versatility has been tested and proven. Though the Vineyard's varied microclimates present themselves as a challenge to many, we at Crosswater are committed to this sensitive coastal area - The Plant Zone 7a. -Van Sweden/Ohme, A.S.L.A., Ornamental Grasses, Smithsonian Institute, Washington, D.C.